In order to reflect the experience of 1Q84’s first readers, Harvill Secker is publishing Books One and Two in one beautifully designed volume and Book Three in a separate edition. 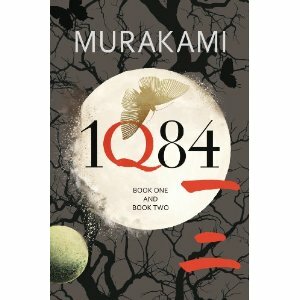 A long-awaited treat for his fans, 1Q84 is also a thrilling introduction to the unique world of Murakami’s imagination. This hypnotically addictive novel is a work of startling originality and, as the title suggests, a mind-bending ode to George Orwell’s Nineteen Eighty-Four. (The number 9 in Japanese is pronounced like the letter ‘Q’). Volumes 1 and 2, published in a single £20 volume, is strictly embargoed. It will only be available to buy from midnight on October 17/18, and so excited are we about its publication that we will be having a special night in the bookshop to celebrate, culminating in the book being available to take home at midnight. The evening’s entertainment, which costs just £30 (the ticket price includes a copy of the book) will run as follows. The doors will be open from 7.30pm. As you arrive there will be a selection of Japanese drinks and snacks to welcome you to the bookshop. Temaki (hand rolled sushi cones). Miso Soup (a traditional Japanese soup, consisting of a stock called Dashi, in which is mixed Miso paste. Other ingredients change seasonally). Gyoza (traditional meat or vegetable dumplings usually eaten with a dipping sauce). Gobo Salad (Gobo is burdock in English, and as well as using the root of the burdock, this salad often includes carrots and sesame seeds). Wakame Seaweed Salad (Wakame is a thin and stringy seaweed, deep green in color and used in making miso soup as well as this delicious salad). Once the meal is finished, there will be a screening of the classic film Norwegian Wood, directed by Anh Hung Tran and based on Haruki Murakami’s most famous book. At the conclusion of the night each guest will be given a copy of 1Q84 to take home. We will have parking permits for non residents who want to drive to the bookshop on the evening. This will be included in the ticket price. A meal, drinks, a film and a copy of 1Q84 by Haruki Murakami. All this for just £30. Also, each guest will be entered into a raffle with a chance to win an extremely rare Proof Copy of 1Q84, which we have been lucky enough to get from the publishers. Tickets for the evening are available on our website which you can get to by clicking this link. 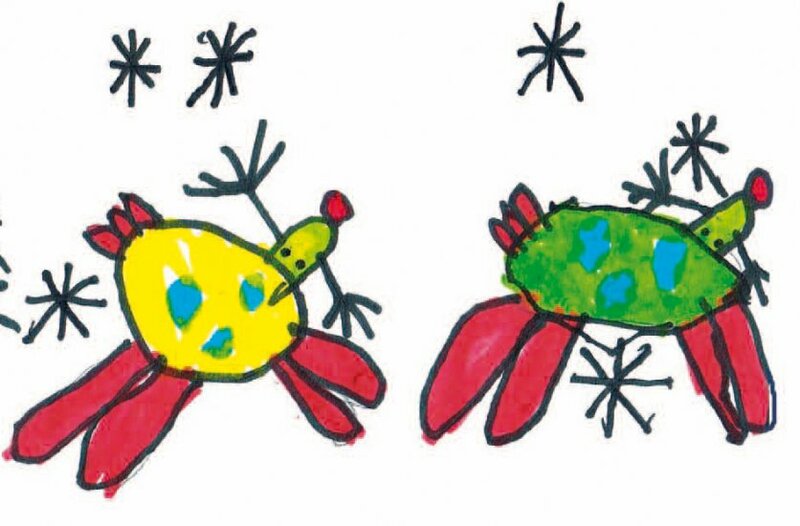 With only 89 days until December 25th, we thought it was time that we launched our first ever Children's Christmas Card Competition. Will you draw reindeers? It's entirely up to you. This is the chance to have a Christmas Card designed by you on sale at the Big Green Bookshop. Not only that but one lucky person will win a £50 voucher to spend at the Big Green Bookshop. 2. Complete your Christmas card design, you can design all sides of your card but you must design at least the front. 3. Post or deliver your finished design to the bookshop, all entries must be submitted before Saturday the 5th of November. 4. All cards must also include your Name, Age and School (if applicable) Parents or guardians Email and contact telephone number. There will be 2 winners from each category, and one overall winner. The winners from each category will win a £10 voucher to spend at the Big Green Bookshop. The overall winner will receive a £50 voucher to spend at the Big Green Bookshop. There will no doubt be a photo opportunity with the Local Press too. Could there be robins on your card? You decide. The six winning designs will then be made into cards and sold at the bookshop in December. Other designs that we like will be displayed in the bookshop over November and December. Have fun designing your cards and good luck. Rumour has it that there's a TV programme on called Strictly Come Dancing which runs for months at a time, in which rugby players and weathermen and politicians dance with professional dancers for our entertainment. Some of these 'celebrities' become quite proficient at dancing, and eventually become so good that they could almost compete in non TV competitions. I suspect they don't though, as the money isn't as good. Earlier this year Gwyneth Paltrow's Cookbook was published. I think Marian is a very good writer. She's very funny and her books are a lot smarter than many others that hers are lumped together with and she obviously has a massive appeal. 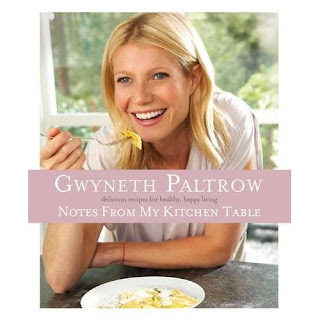 And Gwyneth is by all accounts an actress of some stature. Call me a misery guts, but if I liked dancing, i'd rather watch two people at the very top of their game, rather than a clumsy rugby player. And if i wanted to get a cookery book, i'd probably get one that was written by someone who knew a little bit more than a keen amateur. Otherwise i'd write one myself. Or am I missing the point. Is it all about greed or something? I dunno. I blame Morecambe and Wise. 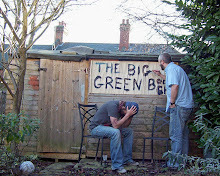 I am on Twitter (@biggreenbooks) Twitter is a social networking and microblogging site (that clears that up then). I tweet for the bookshop. Sometimes I tweet well, most of the time my tweets are pointless and some of the time I tweet badly. I don't really have quality control and don't get worried if people stop following me, which is a good job, because there can only be so many times that people can read 'I am in a train' or 'RAIN!!!' (my two most regular tweets), without wondering why they should have to put up with this. I enjoy tweeting very much most of the time, although sometimes it all gets a little bit silly and angry. Then I close my eyes, wait for all the shouting to go away and then carry on. The people that the bookshop follows fall into four main groups. 1. People in the booktrade. 4. People who I don't know but whose tweets I enjoy. There is a crossover within these groups of course, but this probably covers 95% of the people the bookshop follows. Twitter has been very good for the bookshop, introducing us to new customers, enabling us to contact authors and publishers to help arrange events and also helping to spread word of all the stuff that the Big Green Bookshop is doing. I hope, in turn, that the people who follow @biggreenbooks get some satisfaction from doing so. I have been asked recently by more than 1 tweeter (3) if I would tweet a typical day at the bookshop. People have different ideas about what it's like to work in a bookshop and also i've been told that it would be interesting to see the kind of books that we sold on a typical day. So, I've decided that on Thursday September 22nd, I am going to livetweet a day at the bookshop. It will probably start and end with 'I am in a train' and there is more than likely going to be some 'RAIN!!!' in the middle, but hopefully it will be entertaining and sometimes informative. I will try not to tweet 'sold a book' or 'made a cup of coffee' too much, as that would be a bit boring (although, I do tweet these kind of things anyway). There will be no rules, but I will endeavour to tweet on a regular basis about what the heck is going on at the shop. Hashtag fans (I am not a big one, but understand that sometimes they can be quite useful) will be delighted that I have chosen one especially for the day. It is #biggreenday. At least 3 of you will enjoy this, i'm sure. That's it really. If you fancy coming in so that you can be a part of this odd sort of experimental day, feel free. But don't bunk of school or take a sickie just to visit. That would be above and beyond all that's sane. The Man Booker Prize is probably regarded as the most prestigious literary award in the UK. 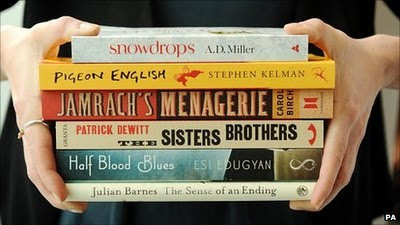 It’s awarded each year for the best original full-length novel, written in the English language, by a citizen of the Commonwealth of Nations, Ireland, or Zimbabwe.On Tuesday September 6th the six shortlisted books were announced. Here are the books, but this time from a different angle. 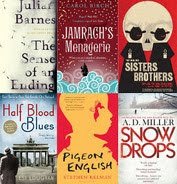 We challeng anyone to try and read all six of the shortlisted books in time for the night of the awards on October 18th. On the night we will meet in the shop at about 7pm to discuss each of the books. After a heated debate, and a glass or two of vino, each of the group will vote for the book they think should win. We’ll then watch the televised ceremony, and hopefully cheer as our choice and the actual winner is one and the same. Or more likely, shout and curse as our least favourite book takes the glory. •For a one off payment of £25, we will be a lending library, where you can borrow each of the books for up a week each. You can also keep your favourite book after the ceremony. •We will offer a discount of 20% on the shortlist. •A group of you could share the cost, so for example 3 of you could buy 2 books each. Of course you can get the books from anywhere you like. Hey, we can't and won't stop you. But however you decide to do this, we will do everything we can to make the books accessible to you. The important thing is that you're able to join in. It's a bit of a challenge, but if you think you're up for it, come along. Here's another important bit. Even if you don't manage to read all six of the books (I haven't managed it myself in the last two years) you are more than welcome to come along and join in the debate on the book/books that you've read. It's supposed to be fun remember. 3 for 2. They said it would never happen. Well, after 10 long long years Waterstone's has announced it is going to stop doing the 3 for 2 offer. Flipin' eck. We couldn't let this pass without marking this occasion in some way. I know. Let's have a 3 for 2 at the Big Green Bookshop. Yes, on Saturday, September 10th, we will be having a 3 for 2 on ALL our books (and bookmarks and cards). As is traditional with these things, the cheapest item is free and we will have biscuits. And maybe cake. I will not be stickering any books though, for that would be foolhardy. This is likely to coincide with the glorious launch of our secondhand books department, if we can price them all in time. Three or four bookcases of lovely books a good proportion of which were kindly donated by our customers, including 3 copies of Charlie Brooker's Screenburn and a lovely selection of old Penguin Van Der Valk crime novels. COME ALONG. It will be groovy. And there maybe cake.